We woke up in our aire in Villeneuve les Maguelone to the delightful news that, as our privacy blinds were shut and our displayed ticket on the dashboard was partially obscured, we had a police message on our windscreen notifying us that a spot fine would be sent to our vehicle’s registered address for non-compliance with the site’s rules. (Good luck with that). Next up, the services we had paid for in the cost of the ticket were also all out of order, water taps turned off and grates frozen solid so there was no way to empty Benny’s waste. All in all, not quite the experience you hope for in a paid commercial aire, especially considering how hard they made us work to pay for our entry to the aire in the first instance. We left early, glad to be away, and hugged the coast south then east along to La Grand Motte. This area was filled with small waterways and pleasure boats, with lots of ‘futuristic’ apartment blocks, looking like Star Wars transporters, lining the streets. The beach here is said to be beautiful but unusable for sunbathing as high winds batter it continually, even in the height of summer. 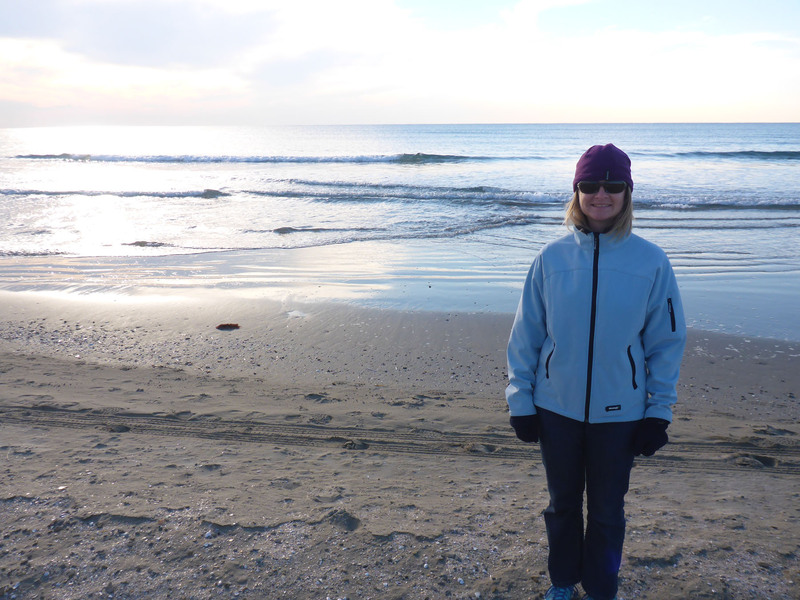 We stopped for a few minutes to have a look at the sea and along the narrow expanse of sand, but it was a very cold morning so we didn’t walk far. 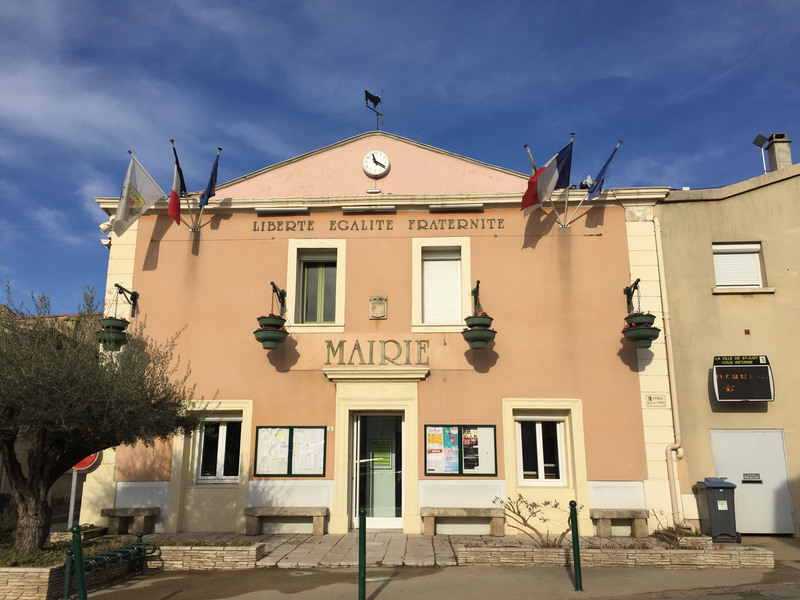 Passing on through, we turned north to the town of Lunel and then a little way back west to the small, rural village of Saint Just, on a remembrance pilgrimage of sorts. 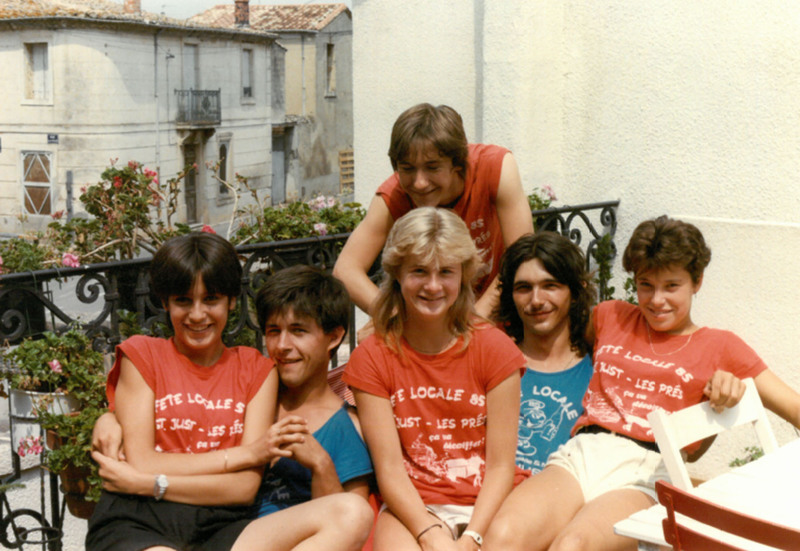 Many years ago, Nicky had a French school exchange visit to this village when she was fifteen, staying there with a local family who owned and ran the local Boulangerie. When Nicky’s Mum and Dad dropped her off at their house, she was the only English person in the small French village for two full weeks. She spoke only French the entire time, a total immersion experience. 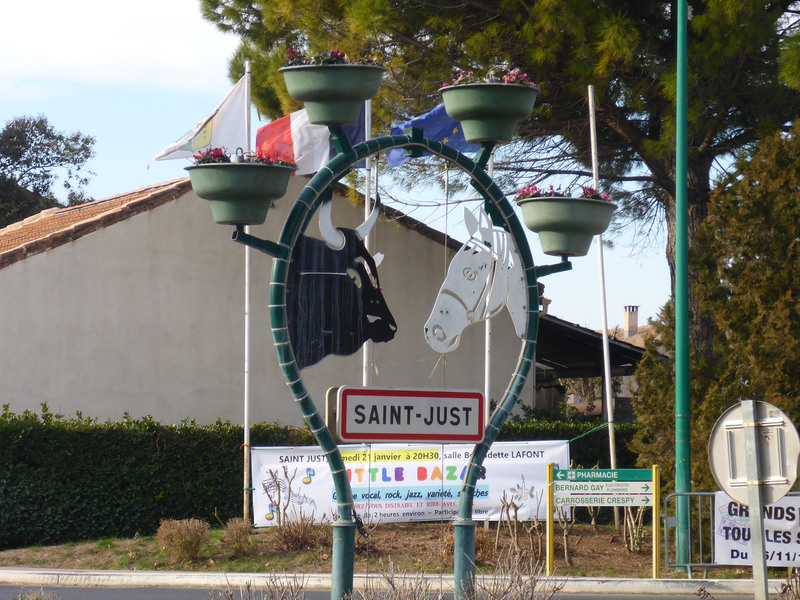 The first week included a local village festival involving dancing, bull fighting, Camargue horse running and barbecues. The second week was more wide-reaching, with visits to the local towns of Nîmes, Montpellier and La Grand Motte. All the time she was loving the experience of living above a busy boulangerie and patisserie, building indelible memories of France. She returned the following summer for a few more weeks, and got to know Sophie, her extended family and her circle of friends quite well. 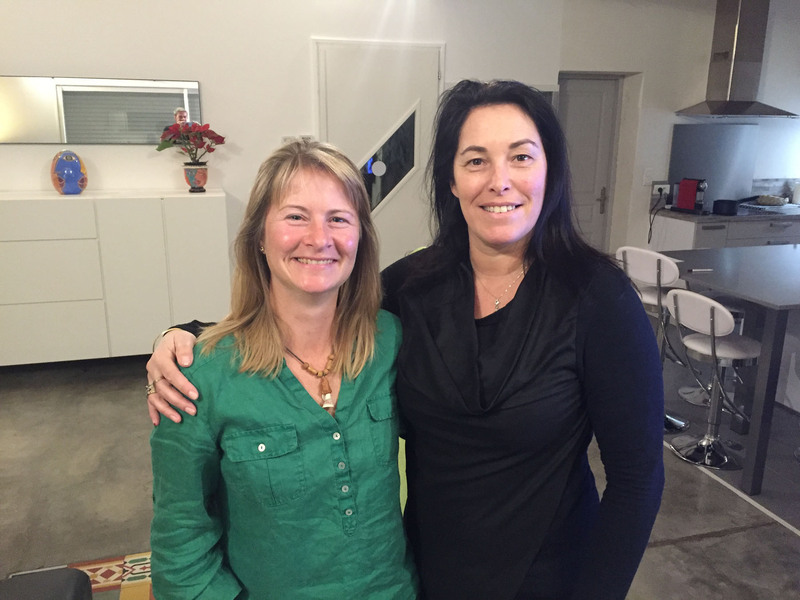 She had since lost touch for many years but through the magic of Facebook, she contacted the bakery recently and got reconnected with Sophie, who now lived with her own family in the nearby village of Boisseron. She hadn’t strayed too far from the original family business though, and now runs her own boulangerie in her new town. 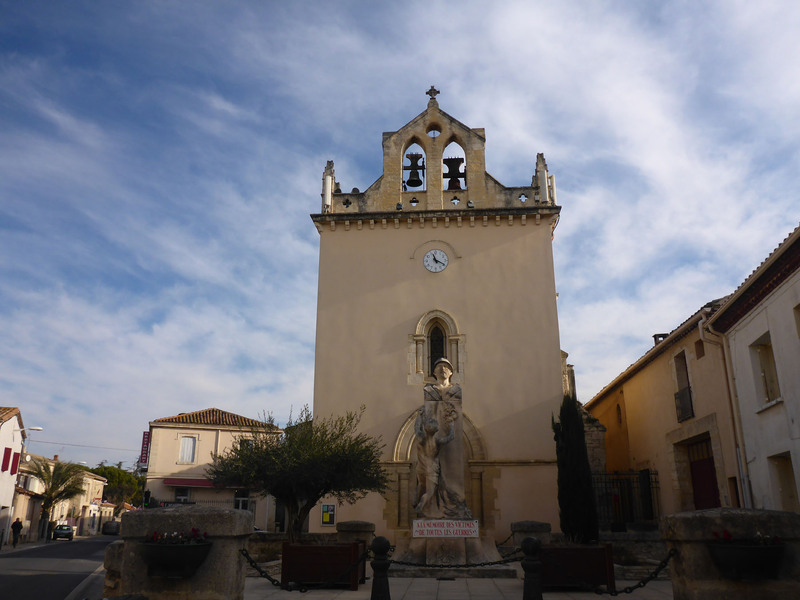 We walked around the centre of Saint-Just, allowing Nicky to reminisce on the changes since, and the similarities remaining, to her time there. Nicky recited stories of what the gathered local youngsters did in this yard, or what happened over here, of being made to buy cigarettes for the local kids in the Tabac, so their parents wouldn’t find out they were smoking. 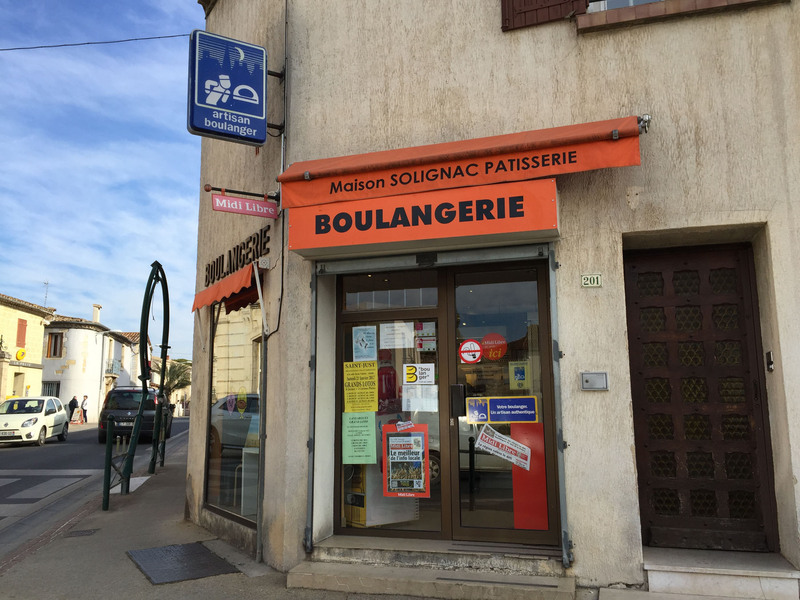 We nervously went into the boulangerie, and Nicky talked to the lady behind the counter. It turned out that Sophie’s parents had now retired, and her brother managed the boulangerie. After much chatting, with some members of the forming queue getting involved and interested in the story, we left Nicky’s village of teenage memories to meet up with Sophie. On the way we drove a little way north, to the village of Sommieres for a short visit, as we had heard it was a pretty town. On our way we passed a horrific traffic accident site. The air-ambulance helicopter was circling and landed just as we passed by in stop-start traffic. One of the cars involved was totally destroyed, only the engine block and chassis making it recognisable. The wreckage was surely not survivable, although we never did find out for sure. Our initial view of Sommieres as we arrived didn’t disappoint, as we crossed the narrow bridge into town. 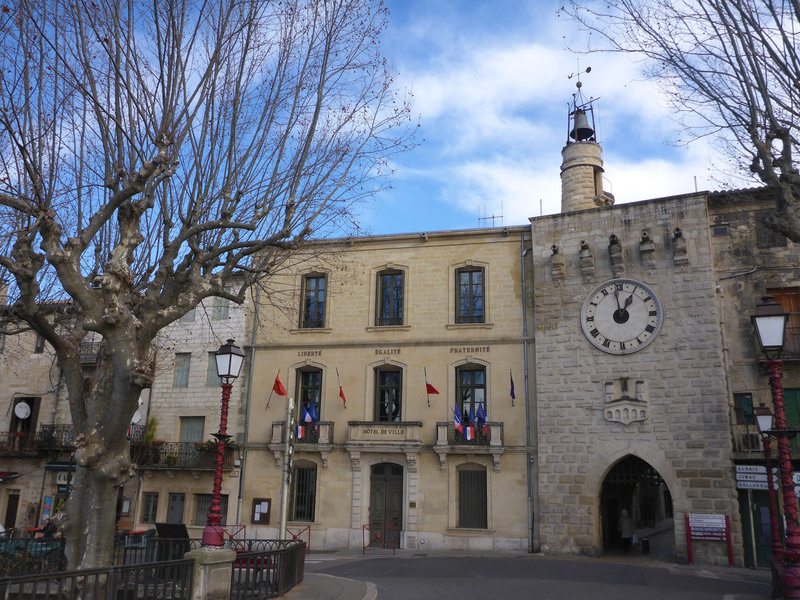 The Mairie and an adjacent stone clock tower sat directly in front of us, lit up beautifully in the early afternoon sun. They were framed with tall plane trees and draped with flags, and looking very French. We parked up in a free aire by the river and walked back into the centre, enjoying the fresh, chilly air as we passed through the lovely squares and cobbled streets. We climbed up through the town to a castle on the hill behind to bask in the fantastic vista over the roofscape. We headed next to the village of Boisseron to our pre-arranged meeting with Sophie. The whole conversation was carried out in French, with Nicky handling herself comfortably and providing intermittent translations into English for her less linguistically-gifted husband. After an excited reunion and the introductions of husbands the girls, busily reliving their teenage memories, settled into easy conversation. They enjoyed reminiscing and chatting about Sophie’s family, friends and the intervening thirty years, and Sophie kindly invited us to spend the rest of the afternoon and evening with them, so we pulled Benny onto the drive to overnight. 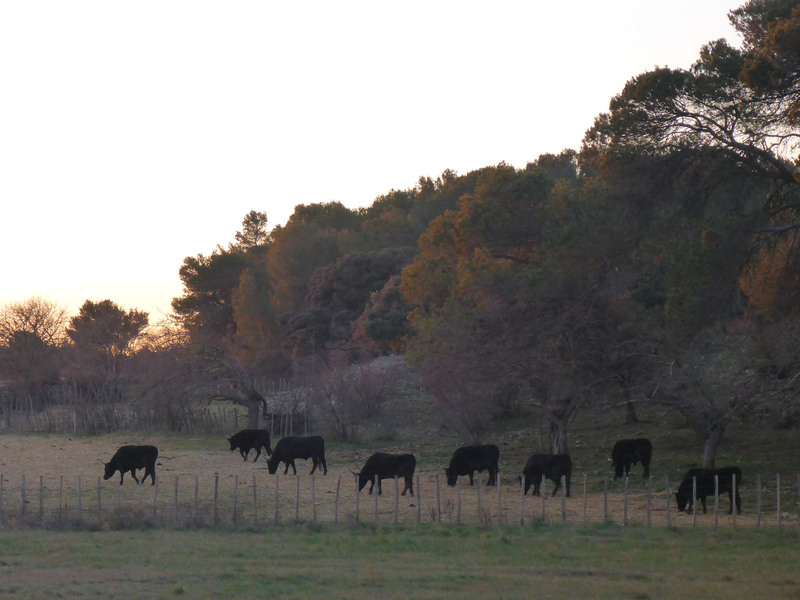 We later went with Sophie for a cold, dusk walk around some local Roman ruins, where we saw many black Camargue bulls in nearby fields. 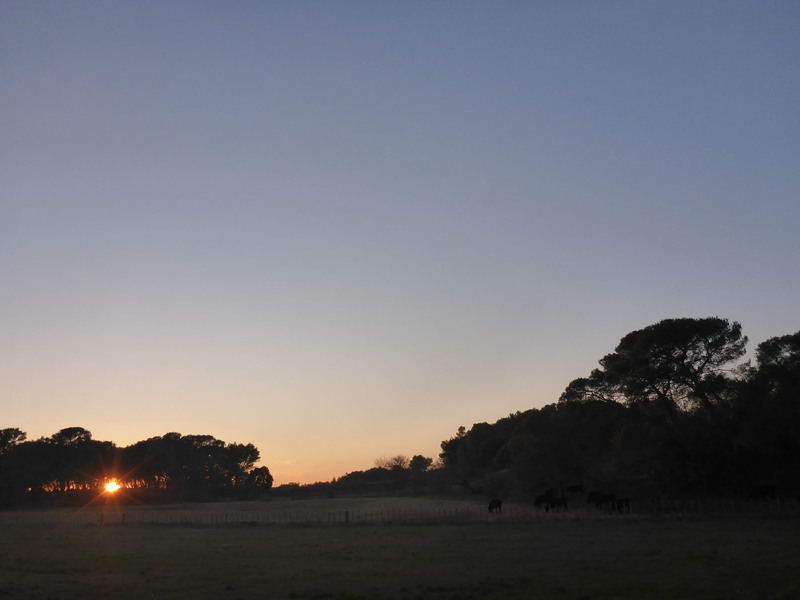 They were bred on this farm for use in competitions, called la course Camarguaise. In comparison to Spanish bullfighting, the aim of the Camargue matador, the raseteur, is to pluck a red ribbon from between the bull’s horns as it runs wild in the arena. Béziers, Arles and Nîmes are all centres for local bullfighting, the Roman built arenas still being put to good use. Although traumatised and irate, the bulls aren’t physically injured, but for the men trying to collect the ribbons it can be an extremely dangerous activity. A dozen raseteurs, all dressed in white, spread out around the arena, calling out to bull to gain its attention and focus, before attempting their steal. They then have to leap up into the stands to escape the charging bull and, hopefully, avoid injury. The raseteur who retrieves the most ribbons is then celebrated in local folklore for the coming year. Later we all had pizza and red wine, as the chat continued, followed by tastings of French whisky. The chat all night was entirely in French. I could understand partially what was being said, but Nicky continued translating for me on occasion so I could keep track of most of the conversation. The following morning their pool was entirely frozen over from the low overnight temperatures. The current weather, Sophie explained, was a rare freak occurrence, the previous January being generally in the mid-teens and mild, rather than the minus five we had been experiencing. We said our goodbyes to Sophie and her family over a hearty breakfast of bread, jam and croissants from their boulangerie, then drove east to the local city of Nîmes for our next adventure. 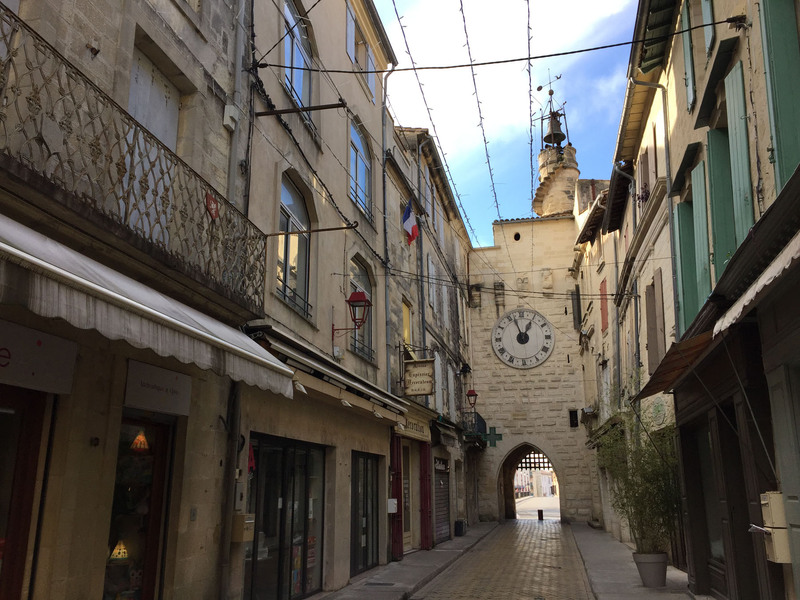 This entry was posted in France, In France, Our Travel Journal on Jan 30, 2017 by Aaron Hill.